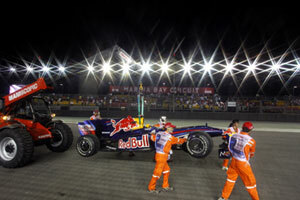 17 January 2011 – Motoring enthusiasts will have the chance to participate as a volunteer race official in this year's Singtel Singapore Grand Prix. Race promoter Singapore GP will be opening registration to the public from 17 January, 8am, to 27 February 2011. Interested candidates may register via the website https://raceofficials.singaporegp.sg. A total of 950 positions are available this year. While Singapore GP expects a retention rate of over 80% from previous years' race officials, there are still many roles available for the fresh intake of recruits. These include observers, track marshals, flag marshals and fire marshals. In addition to receiving specialist hands-on training in fire safety and track recovery, selected senior officials will be given attachment opportunities at overseas circuits to gain practical experience. This year, selected senior officials will be sent to Adelaide, Melbourne and Darwin in Australia as well as Sepang, Malaysia for training attachments. "The Singtel Singapore Grand Prix has one of the most enthusiastic and dedicated group of race officials who have exceeded expectations at our night race and performed exceptionally well at overseas circuits," said Colin Syn, Deputy Chairman, Singapore GP Pte Ltd. "We're looking forward to welcoming our marshals who will get to learn from the very best, acquire new skills in the process and gain a sense of accomplishment by being part of this prestigious motorsport event." Despite having three years of race experience, Singapore GP is continually looking at ways to improve the operational efficiency. 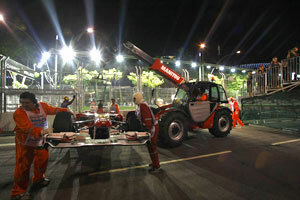 "Last year, we sent 17 officials for a gruelling 11-day training course to be certified as Manitou Operators," said Gabriel Tan, Clerk-of-the-Course, Singapore GP Pte Ltd. "They helped us tremendously during last year's race where we achieved track time recovery records in two instances." The efforts were recognised by Charlie Whiting, FIA Formula One Race Director who commented, "The Singapore Race Officials did an excellent job in 2010, and it was clear that their intensive training program paid off handsomely." Trainee race officials can expect to attend approximately seven days of theory and practical training, conducted over weekends. The first module which covers safety aspects, Formula One protocols and basic track and flag signals, will commence in April 2011. As part of the marshals' hands-on training, they will get to perform recovery and extrication exercises on a Formula BMW car. Interested participants will need to be 18 and above as of 1 January 2011, physically fit, fluent in written and spoken English, commit to all scheduled training sessions and participate in all four days of the race (22 to 25 September). For the full list of prerequisites, please refer to the official recruitment website https://raceofficials.singaporegp.sg.